Enyel De Los Santos might work his way to the big leagues soon. ALLENTOWN — The Phillies opened their minor-league season with a starting rotation at triple-A Lehigh Valley that included familiar names. Zach Eflin and Drew Anderson had pitched in the big leagues. Tom Eshelman had won the Paul Owens Award. Cole Irvin had pitched well last season at double A. But it was the youngest pitcher and the rather unknown, recently acquired righthander Enyel De Los Santos, who emerged for the IronPigs in the season's first month and made himself a prospect. De Los Santos, who won't turn 23 until December, enters Friday's start at Rochester with a 1.40 ERA in his first four starts, with 25 strikeouts and just six walks in 19 1/3 innings. He pairs his mid-90s fastball with a nice change-up and a developing curveball, which the Phillies urged him to throw more often after they got him from San Diego for Freddy Galvis. "I had to get more confident in it," De Los Santos said. "They wanted me to be more consistent with it and throw it in good counts." 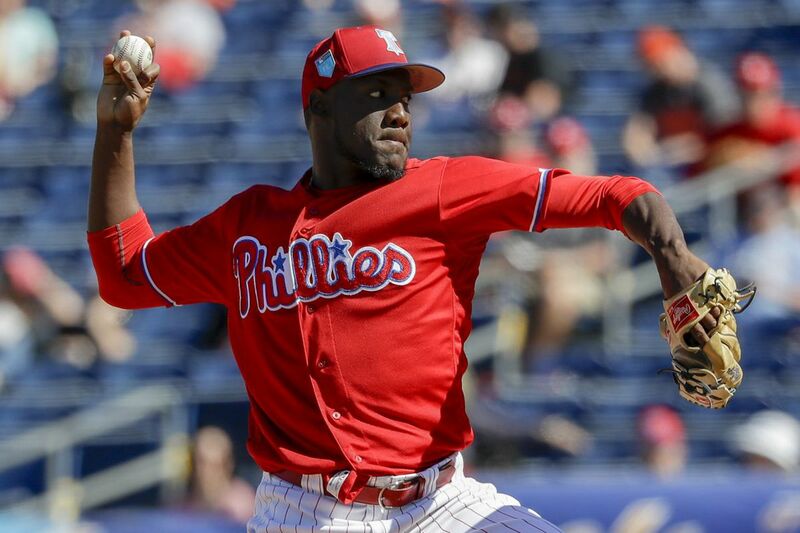 De Los Santos, who is not yet on the 40-man roster, could soon find his way to the majors when the Phillies need another starter. He was in consideration last week when Eflin slid into Ben Lively's rotation spot. Eflin's 40-man spot was an advantage, and the Phillies have no reason to rush the young De Los Santos. But he could soon force their hand. "I feel blessed," De Los Santos said. "It's been great to get a good welcoming into the organization. I feel like I'm ready for whatever challenge is brought." Roman Quinn played right field on consecutive days this week, perhaps a sign that the Phillies are gauging his ability to handle the corner outfield positions before promoting him to the majors. Quinn is batting .303 with a .361 on-base percentage and 10 steals in 19 games at triple A. The Phillies have seemed to make Nick Williams a bench player, but Quinn's speed, ability to bunt, and even his ability to play the infield in a pinch are much more desirable off the bench. He's pushing toward a promotion. Dylan Cozens homered three times Wednesday at triple A, but he's still striking out a ton. He has whiffed in 36 percent of his plate appearances, a slightly higher rate than last season, when he struck out 194 times. … Keep an eye on Darick Hall, a 22-year-old first baseman at high-A Clearwater who has nine homers through 25 games. He hit 29 homers last season. He's a 14th-round pick from 2016.